As one of the largest of its kind in the area, our indoor playground is the perfect setting for children’s birthday parties, seasonal celebrations, or just a fun day out on the weekend when you fancy treating your kids and doing something special. Thousands of children from all over the region have enjoyed exploring our well-equipped indoor playground and because we maintain everything in tip-top condition, replacing older items as they start to show signs of wear and tear, our facility is as clean and safe today as it was on the day we first opened our doors to the public. Simple, Clean and Safe Fun – Younger children are often forgotten by companies that run entertainment facilities for kids and as a result, they spend a lot of time sitting around feeling thoroughly bored while their older siblings have the time of their lives. At Oaktree Play Centre, it’s a different story: our play equipment is specifically designed for children as young as 6 months up to 8 years’ old. 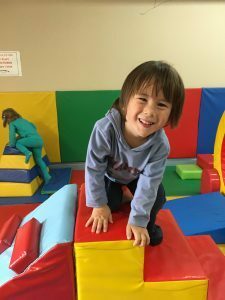 If you are looking for an indoor playground in York Region that puts youngsters first, Oaktree Play Centre is the place to come! Value for Money – Our competitive stay and play rates make our fun facility affordable for all families and ensure you are able to visit again and again, without spending a fortune in the process. What’s more, if you decide to have a party here, you can use our hygienic kitchenette to prepare all the food you need, thereby avoiding the need to pay exorbitant catering fees. Hours of Fun for Everyone – With a jungle gym, well-designed obstacle course, ball pit and dedicated soft play area, our indoor playground in York Region provides younger children with hours and hours of entertainment. Older siblings can enjoy a movie in our private theatre or have a bite to eat with mum and dad while the baby of the family has the run of our fabulously fun but supremely safe facility. Great Location – Situated in King Road, in the northern part of Richmond Hill, we are easy to reach no matter where in the Regional Municipality of York you happen to live. If you would like further information about the best indoor playground York Region has to offer, pick up the phone and call us today. We are always happy to help in any way that we can.